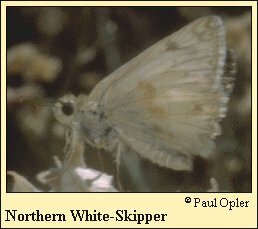 Identification: Upperside of male is white with narrow black chevrons at the outer margins of wings; female has thicker, darker markings and black at the wing bases. Underside of both sexes is white with pale tan markings. Life history: To find females, males patrol in canyon bottoms. Females deposit eggs singly on young leaves of the host plants. Caterpillars feed on leaves and live in shelters of rolled or tied leaves. Flight: Several broods from April-October. Caterpillar hosts: Various mallows including globemallows (Sphaeralcea), hollyhock (Althaea), and mallow (Malva). Habitat: Open woodland, chaparral, dry washes, desert mountains, arid land. Range: Eastern Washington south to western Colorado, southern California, Arizona, Baja California, and northwest Mexico.